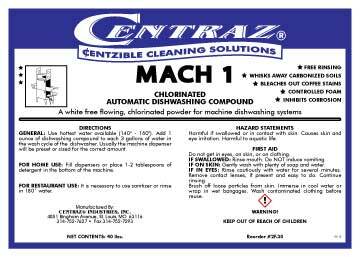 Food Service & Warewash – Centraz Industries Inc.
Lime Buster is a multi-purpose acid detergent that removes beerstone, milkstone, calcium, rust, and lime. Deluxe Dish is a biodegradable dish detergent with long-lasting suds to cut grease and soil. Superb is a high-sudsing, long-lasting hand dish detergent designed for greasy and oily pots, pans, dishes, and utensils that are washed by hand. Blu Fome is a mild, concentrated liquid detergent for hand-washing greasy dishes in commercial, industrial, and institutional kitchens. It's safe for use with enzyme grease trap treatment. Auto D is an all temperature detergent designed for automatic dishwashers. It may be used in high- and low-temperature machines. 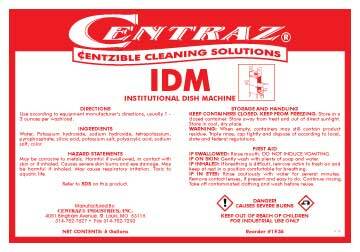 IDM is an all-temperature detergent designed for automatic dishwashers. For Professional Use Only. 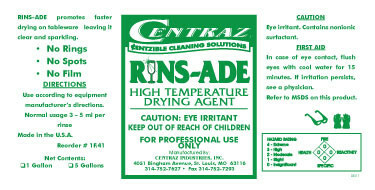 Hi Temp Rinse Ade prevents rings, spots, and film from marring the clear sparkle and shine of your tableware. While Hi Temp Rinse Ade is effective in high temperatures we also carry a Hard-water version. Spot-Free Low-Temp Rinse Ade prevents rings, spots, and film from marring the clear sparkle and shine of your tableware when used in low-temperature automatic dish washers. A Hard-water version of Spot-Free Low-Temp Rinse Ade is also available. Dyna Shine is a semi-viscous, high-alkaline cleaner designed to remove tough grease and carbon deposits. Dyna Brite is a biodegradable, concentrated non-butyl-based multi-purpose cleaner. Use it to safely remove grease, oil, and dirt from any surface. Smoke House is an all-purpose cleaner that is formulated to remove the heaviest tar and smoke deposits form walls, ceilings, equipment, and utensils. Mach 1 is a chlorinated automatic dish washing detergent powder. Its controlled foaming action means there are no smothering suds to clog your machine or impede washing action.